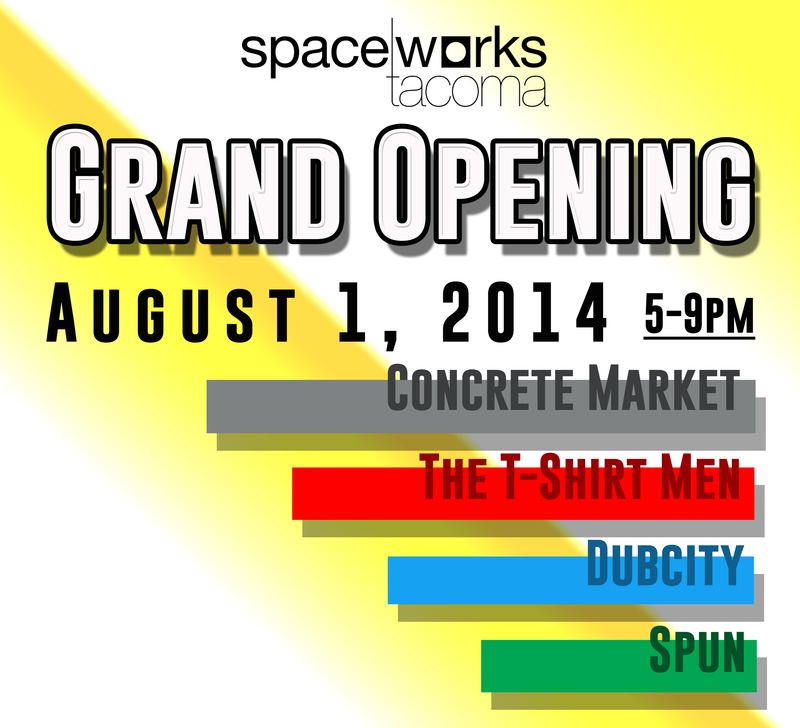 Spaceworks Tacoma invites you to join us for the GRAND OPENING of four new businesses at the corner of S 10th and Martin Luther King Jr. Way. Spaceworks recently partnered with property owner Paul Okner of Fremont Property Group LLC to activate this previously vacant building. Spaceworks signed the lease with Mr. Okner in January then identified four of its creative enterprises to fill the 5,000 square feet of commercial property. For the past few months, Spaceworks and the business owners have been preparing the space for business. Now all four businesses have completed their renovations and improvements, and are ready to open their doors and celebrate. The grand opening celebration of Concrete Market, The Tshirt Men Company, SPUN Clay Arts Studio & Gallery, and DubCity Studios will be 5:00 to 9:00 pm on Friday, August 1 at the corner of S 10th Street and Martin Luther King Jr. Way. Each business will host an open house and offer a variety of fun experiences for customers. Details about each business follows. Duncan Susag, owner of Sound Concrete Countertops, joined Spaceworks in order to further his business by establishing a showroom, gallery, and retail space. He recently opened “Concrete Market” which sells artisan concrete designs for residential and commercial spaces. Duncan and his right hand man Mac Haskins transformed the 800 square foot office space into a sleek showroom allowing visitors to see how beautiful and functional concrete can be. Owners of The Tshirt Men, Willie and David Combs, applied to Spaceworks in order to move their print production out of their downtown Tacoma apartment and to create a retail presence. Now The Tshirt Men produce custom-made tee-shirts all day out of their new storefront. On August 1, all are invited to bring a blank tee and print their own. Jennifer Ohrazda and April Sanders, owners of SPUN, dreamed of moving their potter wheels out of the garage and into a retail space – Spaceworks helped make that a reality. For the beginner or advanced potter, or just those who enjoy getting messy, SPUN provides a patient, casual, and creative environment. SPUN offers regular pottery classes, open studio (‘Free Spin’), and the option to sell their work in the SPUN Gallery. Monopoly Entertainment has a long history in Tacoma as a premiere promotions and marketing group for nightclubs, music artists, private parties, and other entertainment opportunities. Owner Kerry Williams came to Spaceworks looking for a rehearsal space to develop his “Unite” Tour. Since acquiring his space he has developed his business model into a full production and rehearsal studio. Kerry, Na-Na Martini & Mac Dris will perform Friday night. The business owners have participated in business training, worked with a modest tenant improvement budget, regularly met for one-on-one consultation, and accessed marketing support through Spaceworks Tacoma. And thanks to Spaceworks’ partnership with the property owner, they have also been provided with 6 months free rent. Spaceworks worked with Crews Photography & Video to create this 4½ minute video about the property and the four businesses. Click here to check it out!